If you just started reading, this is the second day our backpacking trip in Pedernales Falls State Park. Make you sure you catch up by reading Day 1's and Day 3's trip reports. Jack eating breakfast at Pedernales Falls State Park. Getting energy for a long day of hiking. After spending close to 12 hours in the dark (it was a cloudy, moonless night), I was ready to get up and do something. I let BeeGee out of our tent so she could make sure Jack was actually awake. She accomplished this by sticking her nose into the side of the tent and power sniffing. After everyone was awake, we cooked a breakfast of pancakes and Tactical Bacon. Finally, we broke down our tents, packed our bags, and headed out for adventure. We quickly made our way back to the fork and started our trip up to Wolf Mountain. The trail remained wide, graveled, and easy for the most part. Moreover, the trail is a big loop, so you end where you started. Not too far into the walk, there was a vault toilet for the primitive campsites. If you ever stay in the area, make sure to use the vault toilet. At the bathroom area, the trail forks again and we decided to hike on the Pedernales River side of the trail, which headed towards Jones Spring. The area is pretty uniform with small canyons, oak trees, and juniper trees, but is still amazing to look at nonetheless. Jones Spring was a nice stop. The spring is fairly large and feeds a medium sized pool of water and a small creek. We stopped to filter some water, and have a quick drink. Across from Jones Spring was an archaeological site. 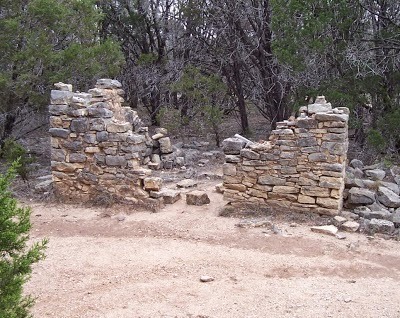 There is an old stone settler’s house and a rock wall. The site is approximately from the 1870’s and most likely established there because of the reliability of Jones Spring. Continuing on we traveled around the south side of Tobacco Mountain. The trail in this area got a little narrower in this section and felt more like backcountry. There weren't any high views here, but the forest itself was very relaxing. After another mile or so of hiking, we made it to the fork around Wolf Mountain. Unfortunately, there is no way to reach the Peak of Wolf Mountain, which I was a little disappointed about. Nevertheless, we decided to take the eastern path. This turned out to be the right choice as it provided a nice view down into the Pedernales River Valley. Shortly after this, we were back at the fork for the primitive campsites, and continued back towards the trailhead looking for the Ranch Road Trail. We eventually found what appeared to be split off the trail on our way back to the trailhead. While, I’m not actually sure this was Road Trail, it took us through one of my favorite areas in the park. The trail appeared to parallel the Wolf Mountain Trail, but took us much closer to the bluffs and the Pedernales River. BeeGee looking over the edge of a bluff. Watching the water flow below. The Trail was narrow like singletrack and felt like we were much deeper into the backcountry than we truly were. We passed numerous small waterfalls, cliffs, and pools of water on this short trail. Around lunch time we found a series of small waterfalls and deiced this was a great spot to take a break. We had lunch, filtered, water, and watched the quick flowing water. Whichever trail we ended up on merged back with the Wolf Mountain Trail just before the trailhead and parking lot. The hope was that it would end up somewhere near the Twin Nature Trail because that’s what the park map showed. With no easy way to walk to the Twin Nature Trail, we were forced to drive over to the trailhead. Twin Nature Trail only half a mile, but it is narrow, rocky, and steep. Plus, there are multiple large rock outcroppings, which making walking difficult. Even with all of that, this was another one of my favorite areas. The trail takes you down to an observation deck to view 2 waterfalls, pools of water, and a fairly green area considering its winter. Only one of the falls can be completely seen from the observation deck. After having a look at the falls for a bit, the trail looped us back to the trailhead. From there, we continued on to our final trail for the day, the 5.5-Mile Loop Trail. The only visible waterfall from the observation deck. At the Twin Falls observation deck. Once again, there was no way to walk from the Twin Nature Trail to the 5.5-Mile Loop Trail. So, we had another short drive to the trailhead. There were a lot of people starting the trail with us, mostly families with young kids. Shortly into the hike, we reached Trammell’s Crossing, which is a low water crossing. We took our shoes and socks off in preparation of walking through the water. The water was about calf deep, cold, and over a slick surface. BeeGee made it across with no issues, but Jack and I thought it was a rough experience. The families stuck around to watch us cross, but decided it wasn’t worth it and headed back. After the crossing, we had a large climb for Texas and ended up in an area covered by grass, prickly pear cactus, and mesquite trees. The trail itself wasn’t all too entertaining and ended up being confusing. There are a lot of old ranch roads that split off the main path. Thankfully, there are multiple signs pointing the way that were put in place by a Boy Scout project. BeeGee and Jack walking down the trail. The 5-Mile Loop Trail is pretty easy at first. After making it to what appeared to be the highest point in the area, we headed down a step down hill, and the trail became a lot rougher with limestone rocks everywhere. The downhill led us to the park’s boundary, which was marked by a barbed wire fence. A quick look at the map made us realize we missed the most important part of this trail, the scenic overlook. We backtracked and made our way to the scenic overlook area. The area is in no way labeled and is incredibly easy to miss. So, make sure you are on the lookout when you reach a high flat area. The scenic overlook provides a wide view of the Texas hill country with multiple Texas Mountains in the view. We sat on a wood bench for around 15 minutes and enjoyed the view. I would have liked to stay longer, but the sun was getting low and the wind was chilly. The scenic overlook at 5-Mile Loop Trail. You can see the Texas Hill country and Texas Mountains. The next section of trail, along the boundary fence, has some more settler sites. As we were walking along, I noticed a wooden pole and a small trail that traveled into the woods. We headed in and found a settler’s cemetery. We saw about 3 easily identifiable graves, but there are supposed to be around 12 total. In addition, none of the headstones were legible. Past the cemetery, there are plenty of rock walls in the area. In the area of a fork, an old wood corral can be seen from the trail. In that same area, there is also a settler’s chimney. We didn’t see it, but if I had known about it, I definitely would have searched for it. At the fork, you can take the main path back towards the trailhead or continue on a 1-mile spur for a longer walk. The fork isn’t well labeled and we walked the spur by accident. If you are looking for a longer hike, I would take the spur, but other than that, there isn’t much to see. After we finished the 5.5-Mile Loop Trail, we drove back over to the Wolf Mountain Trailhead. We did the 2-mile walk to the primitive camp area in the dark, which wasn’t too hard as the trail is wide and smooth. We found our campsite from the night before wasn’t occupied and we pitched camp there again. We boiled water for our dinners and headed off to bed for another long night of darkness. Since it was a little chillier that night, I put BeeGee’s jacket on to help her stay warm. However, it didn’t seem to help enough. I frequently wake up to make sure BeeGee is still covered up by her blanket and at one point I noticed she was shivering a little. I called her over so she would get cuddle close and unzipping my sleeping bag. I covered her up with my sleeping bag and ended up awkwardly sleeping with my upper body on my sleeping pad and my lower body on her pad. Thankfully, it worked and we both slept toasty after that point although awkwardly. Make sure to keep reading for our final day during our trip to Pedernales Falls State Park. If you like the blog, go ahead and follow us on Facebook. Looks like a lot of fun! I'll have to continue dreaming of the Texas Hill Country rather then visting myself, but Pedernales Falls was on my list of places to see when I my work was debating about transferring me to Texas. The hill country is a great place to visit. I would recommend it if you ever get the chance to adventure in central Texas.